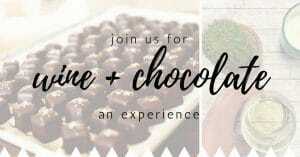 Join us for a very special event: Wine + Chocolate! We are pairing up with Erika of The Chocolate Season in Algona to provide you with this excellent experience in wine and chocolate tasting! Erika will be pairing her beautifully made artisan chocolates with these Soldier Creek wines: St. Pepin, Maréchal Foch, Frontenac, St. Croix,..